Väinö Raitio was a Modernist Finnish composer whose works were received with considerable reservations in his lifetime. Today, Raitio’s music is interesting both because of the period in which it was written and because of its artistic quality. Pluralism has rehabilitated Raitio, and music historians no longer need to adhere to the dramatic martyrdom conventionally ascribed to him. Väinö Raitio (1891–1945), Aarre Merikanto (1893–1958) and Ernest Pingoud (1887–1942) were the misunderstood and neglected pioneers of Finnish musical modernism. It is a good story, and Finnish music historians have enjoyed repeating the narrative of uncompromising forerunners who emerged in the cosmopolitan 1920s and were politely smothered in the nationalist 1930s. Under the pressure of external circumstances, Merikanto became a stylistic turncoat, while Pingoud became a depressed petty civil servant and eventually committed suicide by throwing himself under a steam locomotive. And what about Raitio? He survived, albeit poor and sickly, and true to his calling he wrote colourful music that never saw the light of day. In the modernist-pioneer narrative, Raitio comes across as a noble and uncompromising martyr who shunned an easy life and dedicated himself to the service of art. Raitio’s fate as a neglected composer was established as early as in his obituaries, which declared that the value of his work would only be truly understood in the future. Raitio received a thorough and diverse training as a composer. He studied with Erkki Melartin and Erik Furuhjelm at the Helsinki Music Institute (now the Sibelius Academy) from 1911 to 1914. The syllabus was remarkably broad even in the 1910s, and Melartin in particular is known to have been a widely educated and broad-minded teacher. Raitio and his contemporaries had fertile ground in which to grow. Musicians in Finland were well aware of recent trends, because there was a lively traffic in letters, scores and people between Finland and the musical metropolises of central Europe. Although the repertoire of the Helsinki Philharmonic Orchestra was heavy on Sibelius and Beethoven, it was also possible to hear works by composers such as Scriabin and Debussy in Helsinki as early as in the 1910s. However, there was a strong social demand for National Romanticism that persisted beyond independence, well into the 1920s. The elements that had come to be identified as “Finnish” in the early works of Sibelius had laid a firm foundation for the construction of national identity, and these elements were applied to music by other composers besides Sibelius. The time was simply not ripe for cosmopolitan modernism. Raitio was inspired by Scriabin’s mixture of Impressionism and Expressionism. His own musical language first began to emerge in the orchestral work Joutsenet [The Swans], premiered in 1920. The piece was unanimously praised in reviews, and indeed many of Raitio’s early works were favourably received by critics and audiences alike; he was regarded as a promising young composer, and his orchestration skills in particular were admired. Even a work like Fantasia estatica, premiered in 1921 – a Scriabin-influenced work that lacks a clear feel of tonality – mostly met with a positive reception. The premiere of the tripartite orchestral work Antigone in 1922 proved to be a turning point in the reception of Raitio’s music. His style was now denounced as “cacophonic, that is, evil-sounding”. It was deemed inaccessible even for professional musicians and “to the untrained ear, little short of torture”. With Antigone, Raitio seems to have cemented his reputation as a barbed-wire modernist. 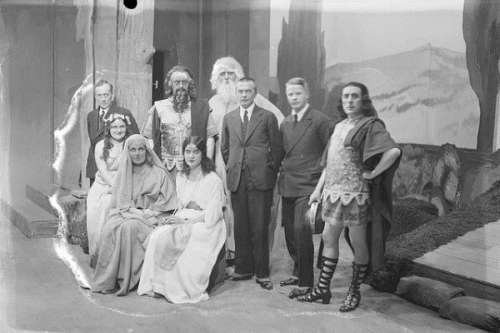 Raitio in the middle of Jephta’s Daughter opera cast in 1931. Raitio is often mentioned as having remained faithful to his own modernist style as the 1930s came along and Finland’s “windows towards Europe” were again closed. However, upholding nationalism and declaring cosmopolitan modernism musica non grata was a trend not unique to Finland, as we well know. This quote supports the conception of Raitio as a trailblazer who curried no favour with critics or listeners. However, although Raitio’s music was undeniably modern for his time, he appears to have been rather a conventional person, at least judging by his correspondence. Instead of living the Bohemian life of an artist, he spent his time at home with his wife and his cats. The Finnish language, Häme in the summer, religion, literature and music appeared to have been important for him. Such bourgeois interests are difficult to reconcile with the modernist-martyr narrative, but perhaps such narratives are a thing of the past. Certainly it would be nice if Raitio’s music were performed more often in concerts, but he can hardly be described as neglected. Väinö Raitio loved cats and even dedicated one of his finest orchestral works, Kuutamo Jupiterissa [Moonlight on Jupiter], to his cat: “I dedicate this tone poem to my cat, who came from Korso. I sent him to Jupiter in October 1922.” This dedication has been read as misanthropic disdain towards the people around him or a declaration of eccentric independence. Raitio himself, however, said he simply wished to honour the memory of a beloved family member. To his wife Hildur, Raitio explained that Kuutamo Jupiterissa was based on a strange dream in which he had travelled in space and seen seven of the moons of Jupiter. Hildur Raitio also recalled that the work was Raitio’s favourite in his output. In this centenary year of Finnish independence, the Finnish Radio Symphony Orchestra is showcasing early modernists. The videos of Ernest Pingoud’s La face d’une grand ville, performed on 1 March, and Väinö Raitio’s Kuutamo Jupiterissa, performed on 10 March, are available on Yle Areena; Aarre Merikanto’s Pan will be performed on 23 April. This article is based on the author’s article “Antimoderni modernisti” published in Rondo magazine in July 2016.